Chelsea Lynn La Bate, better known as Ten Cent Poetry, is proud to announce the release of her debut full-length album, "Picking Through the Pawn Shop," due for release February 15th, 2011. Ten Cent Poetry is the brainchild and artistic expression of Asheville, NC based songwriter Chelsea Lynn La Bate. After spending years honing her songwriting and performance skills on the stages of NYC's Lower East Side and Brooklyn, and becoming a mainstay performer in the New York anti-folk scene that has produced such talents as Regina Spektor and the Moldy Peaches, Ten Cent Poetry has quietly been building an army of avid followers. Through her own brand of melodic folk pop and a constant and relentless touring schedule, she has managed to win the hearts and minds of audiences throughout the country. Known for her lush and vivid "song stories," Ten Cent Poetry paints visual pictures with her words, lyrically exploring human suffering, personal triumphs, courage, solitude and lost love. Now all the sums of her artistic career have been woven into one eloquent story and an even more grand musical statement. Finally, Ten Cent Poetry is proud to announce the release of her long-awaited debut album, "Picking Through The Pawn Shop." Featuring ten new songs that infuse both an emotional intensity and a subtle wisdom not found in most new artists, "Picking Through The Pawn Shop" is sure to make many a top album list in the coming year. Driven by the success of the brand new singles, "Galileo" and "Marco Polo," the album is scheduled for release in winter of 2011 (February 15th). The album was also produced by veteran artists and producers' Will Bradford (SeepeopleS, Freepeoples Frequency) and Brooke Binion (Freepeoples Frequency, The Egg UK) and was recorded in Asheville, NC at Boodub Studios. Completing the recording process, the album was mastered by Will Holland (Pixies, Dead Can Dance, Fall Out Boy) and Eric Welsh at Chillhouse Studios in Charlestown, MA. True to its title, "Picking Through the Pawn Shop" never strays far from the egg-raiding spirit of our musical youths, seamlessly weaving aspects of countless musical genres in her music without ever losing sight of the common thread that binds all the songs on the album. What anchors these bold orchestral excursions throughout “Picking Through the Pawn Shop” are the intensely personal, yet obstensibly universal lyrics that breathe with a riveting perceptivity on every single track of the album. The end result is an album that will both stand the test of time and serve as a strong testimonial to the fact that Ten Cent Poetry is an act we will be hearing from for a long time. In a music market full of flashes in the pan, Ten Cent Poetry's debut will surely serve as the first step in a career geared for true longevity. Highlights include the two singles mentioned above, as well as the endearing "Twilight of Your Love," and the poignant and impassioned "Anticipating Evolution," and "Piano Bench." To add icing to the cake, the album features the fantastic duet "Shallow Breathing," with Mike Grubbs of Wakey!Wakey! and the hit television series One Tree Hill. 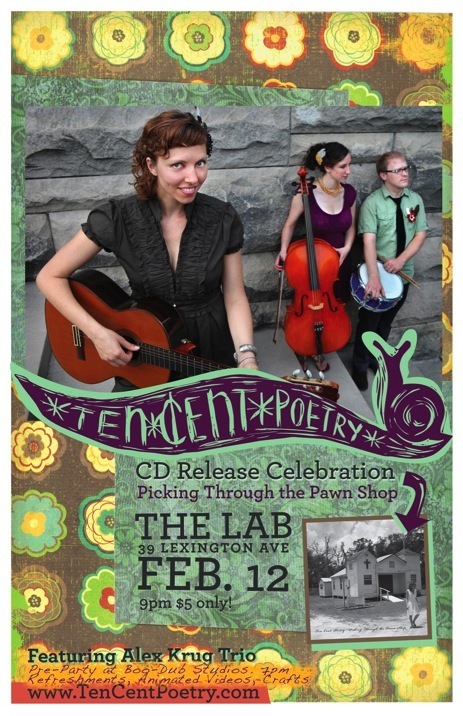 Currently, Chelsea is gearing up for the Ten Cent Poetry "Picking Through The Pawn Shop" CD Release Tour, scheduled to make stops in most major US cities throughout 2011.